I love this J.Jill top so MUCH!! I am just going to be really honest with you right now. I’ve gained a little weight and I usually load it up around my mid-region. So, I can’t really wear any tight fighting clothes anymore because it makes me too self-conscious. When I put this top on from J. Jill, I practically squealed. It was perfect!! Totally stylish and loose enough for me to wear without any issues. Now, I am usually a medium in woman’s clothing, but the top I am wearing in this picture is a small. You will find that the J. Jill clothing line runs a tad big. So, size DOWN when shopping online. 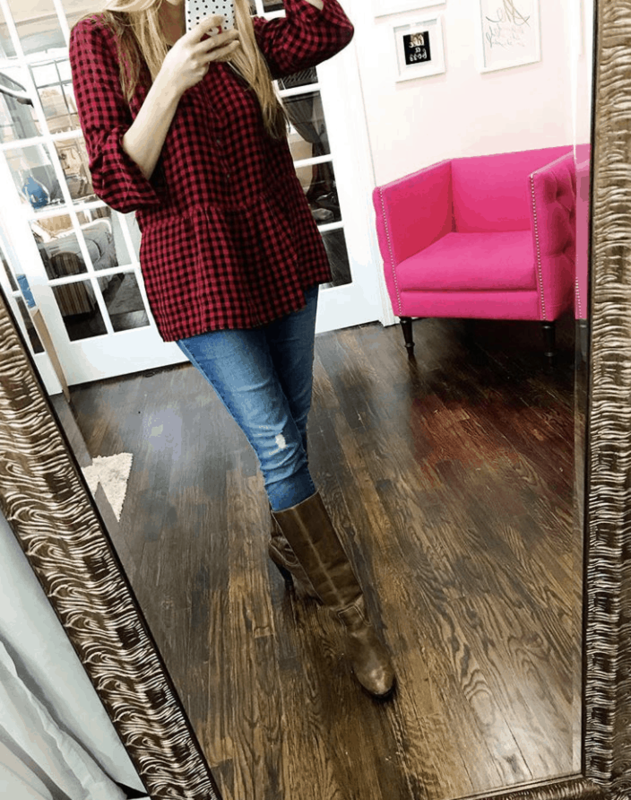 The name of my shirt is the Gingham Shirred-Sleeve Top and it comes in a true red and black check. If you head online today, you can save 40% OFF using code JOY17 at checkout. WOOT!